Autumn is near in our part of the world. That means soup – and pumpkins. So we decided to combine those two autumn affiliates into one slurpy dish. It’s easy to prepare and makes a stunning starter. This soup mingles sweet and zesty in a smooth mix. Because pumpkin spice isn’t just about cinnamon. Pumpkins can take the heat. 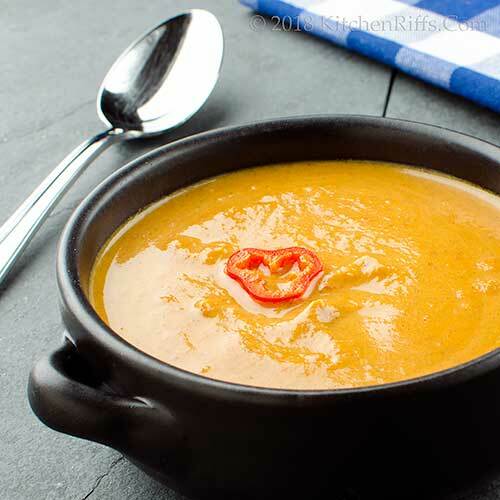 We use canned pumpkin in this soup because it’s readily available and good quality. We also add sweet potato to rev up pumpkin’s mild flavor. Spices and chipotle make this soup bloom. BTW, don’t worry about the chipotle adding too much heat – we include just enough for flavor and interest. Prep time for this soup is about 15 minutes. Cooking adds an hour or so (most of it unattended). You can prepare this dish a day ahead of time if you wish, then reheat right before serving. This recipe yields about 4 first-course servings. Leftovers keep for a few days if refrigerated in an airtight container. Or you can freeze them for a month or more. Peel the onion and cut it into dice. Set aside. Peel the sweet potato and cut it into dice of ½ inch (or a bit less). Set aside. Wash and core the bell pepper, then cut out any white membrane. Cut the bell pepper into dice. Set aside. Melt the butter in a 4-quart saucepan over medium-low heat. When hot, add the chopped onion. Add salt to taste. Sauté for 2 minutes. Add the chopped bell pepper. Sauté for 5 minutes. Add the canned pumpkin, diced sweet potato, and chipotle. Add the spices (cinnamon, ginger, allspice, cloves, and nutmeg). Stir to combine, then add the chicken stock. Bring the mixture to a simmer. Cook for 45 minutes (or up to an hour). Once the soup is fully cooked, use an immersion blender to break up the chunkier ingredients; blend until you achieve a smooth consistency. Taste, then add more salt if necessary. Add the brown sugar if you want a slightly sweeter flavor. Stir in the heavy cream, if desired (to taste; we use 2 to 6 tablespoons). Cook for another minute. To serve, ladle into bowls. Garnish (if desired) with diced bell pepper, slices of miniature bell pepper, or chopped parsley. We generally serve this soup as a starter, but you could also use it as a main course. In that case, you’d probably want to add some crusty bread to the menu. You can use one large red bell pepper in this dish. Or try some miniature sweet bell peppers (they look like hot chile peppers, but aren’t). These mini bell peppers usually are sold in packages of about a dozen. Instead of red bell pepper, you could use orange or yellow. Or a mix of colors. Red onion adds depth of flavor to this soup. You could substitute yellow or white onion, but we think the sweetness of red onion works better in this dish. Speaking of which, pumpkin takes well to sweetness. So you may want to add some brown sugar to bring out its flavor. Maple syrup would also work. But don’t add too much – this isn’t pumpkin-pie soup. You can skip the heavy cream if you want, but we think it adds interest to the soup. Use no more than 6 tablespoons; this soup is better with just a touch of cream. We haven’t tried sour cream in this dish, but you could probably substitute that if you wish. If you skip the cream, you could add a bit of sherry to finish the dish (we haven’t tried this, but think it would work). Chicken stock adds great flavor to this soup, but water works fine too. We use canned chipotles in this dish. In the US, canned chipotle chilies usually are sold in 7-ounce cans. The adobo sauce they’re packed in is quite tangy – you could use a teaspoon or so in the soup if you wish. Leftover canned chipotle chilies keep for weeks (probably months) if refrigerated in an airtight container. You can also freeze them. If you prefer, you could substitute a teaspoon or two of ancho chile powder for the canned chipotle pepper. BTW, we tend to add much of the salt early in the cooking process – usually when we sauté the onions. That provides a good foundation flavor for the dish. It also means we end up using less salt than if we added it at the end. “Mr. Pumpkin’s a real smoothie, isn’t he?” said Mrs. Kitchen Riffs. “They make themselves at home, no matter what’s on the menu,” I said. Such a lovely autumnal soup! The touch of cream and chipotle sounds fabulous! Hi Liz, the chipotle adds nice flavor, and isn't all that hot. Thanks for the comment. Pumpkin soup is so versatile -- a really large number of places have their own versions, though the vegetable they call "pumpkin" varies a lot. In fact there's no line drawn between pumpkin and several other squash varieties that might be in the can you used! I like the Caribbean versions; I've tried a French beef and pumpkin stew; and I was once surprised to see pumpkin soup on a restaurant menu in Australia, to suggest the wide distribution. Hi Mae, you're right about the large number of pumpkin soups out there. Canned pumpkin, in the US, usually comes from southern Illinois -- something like 90%. And if I recall correctly (I may be wrong on this), the "pumpkin" that's grown there is actually a squash (pumpkin is a squash too, of course). Tastes good, whatever it is! Thanks for the comment. Yeah to pumpkin season!Your pumpkin soup looks seriously creamy and comforting! Hi Angie, it's good. :-) Thanks for the comment. This sounds like such a warming fall dinner. Chipotles make everything more tasty! Hi Kelsie, it's definitely a satisfying dish! Full of flavor. :-) Thanks for the comment. I usually make squash soup but I am going to give your delicious looking pumpkin soup a try. Hi Gerlinde, you could definitely substitute squash for pumpkin in this soup. Or use both! :-) Thanks for the comment. This sounds great, John! I'm sure the smoky spice of the chipotle pepper adds a nice dimension to it. We do spicy mashed sweet potatoes for the same effect. Hi Terry, we also like chipotle-spiced mashed sweet potatoes! Chipotle and sweet potato is a dynamite combo. :-) Thanks for the comment. 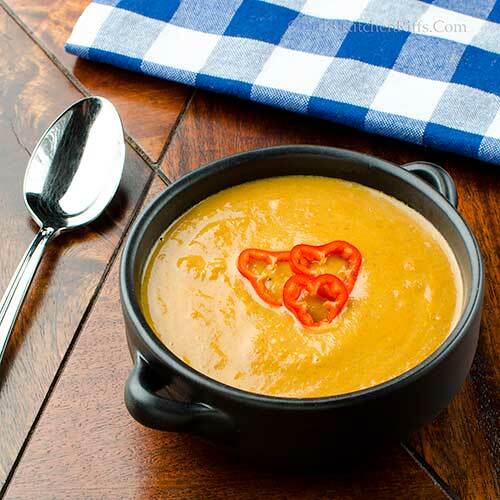 Nothing screams fall more than a pumpkin soup! Love the addition of chipotle. Hi Laura, you know it's fall when the pumpkin recipes start to appear. :-) Thanks for the comment. Wow! This looks so delicious! I have been looking for a fall-inspired soup to make since I have been getting into the Autumn mode! I love the addition of spicy to blend with the sweetness of the pumpkin! Thank you! I will be making this as our starter for dinner very soon! 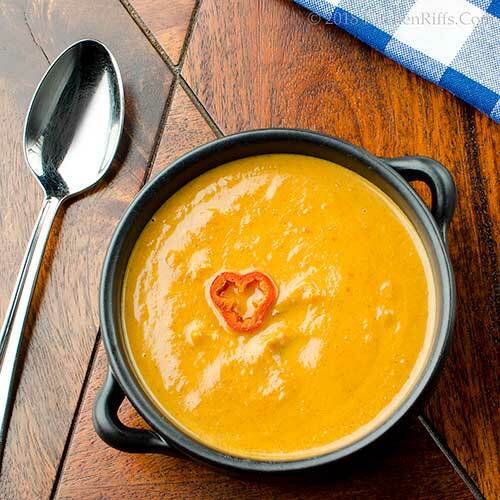 Send some of your fall-like weather our way please - and some of this beautiful soup too! Love this flavors, color and consistency. Wonderful recipe! Hi GiGi, I remember when they made your pumpkin soup for you on safari! You'll have to try this and compare and contrast. :-) Thanks for the comment. Hi Kendra, spicy and sweet play together well, don't they? Thanks for the comment. Hi Tricia, it's been HOT this week but cooler weather is coming this weekend. I think. :-) Thanks for the comment. Hi Merryn, we do love those chipotle peppers! :-) Thanks for the comment. Love how you put that sweet potato and pumpkin together! This is to die for! Such a heart and great looking soup. I am sure it is a family fave! Hi Denise, it is! :-) Thanks for the comment. Hi Sherry, I take it you won't be making this. :-) Restaurants here go a little too crazy with pumpkin this and that at this time of the year, too. Thanks for the comment. I love a bit of heat from peppers with sweet winter squash, and all of those warming spices. Oh my! Yum. This is exactly what I want to be eating this fall. Oh God, is it pumpkin time already again? Last year I made Pumpkin Halloween Cupcakes and I don't know what to do for this year (too much pressure)! I note that you said not to use canned pumpkin pie mix for the soup- wouldn't that be something(although it sounds like it wouldn't make too much difference). Thanks so much for this recipe! Hi Ashley, the two go well together! Nice combo. :-) Thanks for the comment. Hi Valentina, that spice mix really is good -- reason it's a classic. :-) Thanks for the comment. Hi Fran, you probably could use the pie mix, although it already contains spices. Which would throw off the spicing in the recipe(might be too much). But I guess you could just skip adding spices if you use the mix? Thanks for the comment. This looks so comforting, John! And great minds (sort of) think alike (my pumpkin soup is coming in about a week)! I love your addition of chipotle and the sweet potato for creamier texture. It’s cold and damp (okay, cool and damp) here in the desert after a long night of rain, and I can think of nothing better than a bowl of your soup! Hi David, damp and hot here! But coolth will soon arrive. I hope. :-) Looking forward to seeing your soup! Thanks for the comment. I am loving this recipe! Bookmarked. Hi Pam, it's a good one. :-) Thanks for the comment. Love this recipe, had to retweet it the moment I saw your tweet yesterday! I always have ancho chile powder on hand, so I'll use that instead of the canned chipotle pepper. I always enjoy the Notes with each of your recipes. Hi Jean, ancho chile powder has quite good flavor! We use it a lot (often in addition to chipotle!). Thanks for the comment. What a great use of canned pumpkin! With autumn in the air, a bowl of lush soup makes the best dinner. A favortie soup at this time of year! I like the addition of sweet potato and great choice in spicing it up. Hi Deb, canned pumpkin is pretty decent quality, and this is a wonderful (savory) way to use it! Thanks for the comment. Hi Evelyne, we love spicing things up! :-) Thanks for the comment. Absolutely, positively yes!!! I love pumpkin soup and can't wait to get my hands in a pumpkin or squash to start cooking! Your soup looks amazing! This delicious bowl of comfort has it all going on. Spicy, sweet and all of our favorite flavors of fall. This weekend it supposed to be in the high's of the mid 60's F. Perfect soup weather. Hi Katerina, this would probably work with most kinds of squash, not just pumpkin. But pumpkin is awfully good! Thanks for the comment. Hi Bobbi, going to be much cooler weather here this weekend, too. At last! :-) Thanks for the comment. I like the flavor and spice of chipotle you've added to this beautiful fall soup! You always bring just the right flavor combo, John. Hi Judy, this has terrific flavor. Without being overly spicy. :-) Thanks for the comment. Hi Jeff, :-) Thanks for the comment. Hi Greg, it's cooled off here -- hope it lasts, but I'll bet it won't. :-( Thanks for the comment. Hi Debra, I think the butternut squash would be wonderful in this soup! It has such terrific flavor. doesn't it? Thanks for the comment. What a great fall soup! I do have a chipotle pumpkin I make but I can't wait to try this amped up version! Just wish our weather would start to feel fallish! Hi Abbe, weather has been weird, hasn't it? Finally starting to cool off! Thanks for the comment. Hard to believe the season for pumpkin-everything is just around the corner. But then again, pumpkin is so good, why not enjoy it year-round, right? Hi Carolyn, pumpkin year-round sounds like an excellent idea. :-) Thanks for the comment. Hi Amrita, isn't this so nice for cool weather? And the texture is lovely! Thanks for the comment. Autumn perfection. Pumpkin if such a wonderful versatile squash. I remember the first time I realized it wasn't sweet! Love the chipotle in the soup. Whole Foods sells organic pumpkin puree in an aseptic container and I stock up when I see them. It's really nice and thick. Thank you John! I happen to have 2 cups of frozen pumpkin puree in the freezer that really needs to be used. Wednesday is going to be unusually chilly here, so what a great soup to make for a chilly day. The flavor of the soup sounds delicious with all the spices you add. Great soup! Hi Mimi, I haven't had the Whole Foods pumpkin puree, but have heard it's really worth getting. Will have to try it! Thanks for the comment. Hi MJ, glad to help you out. :-) You'll like this -- terrific flavor. Thanks for the comment. I always appreciate something pumpkin spice that actually has pumpkin in it. This looks insanely comforting. Hi Laura, actual pumpkin in something pumpkin-spice? A novelty! :D Thanks for the comment. This soup is just perfect for autumn - absolutely delicious! Hi Amy, it's a wonderful soup! :-) Thanks for the comment. Looks delicious, John! What a smooth tasty soup to make! I love the chipotle and red onion in it, has to be spicy good. Thanks for the recipe! Chipotle is so good with pumpkin and sweet potato. Love this direction with "pumpkin spice!" Hi Pam, chipotle is good in anything! :-) Thanks for the comment. Hi Lisa, best pumpkin-spice dish ever. :-)Thanks for the comment. Sounds like a great soup to start autumn. I love comforting soups like this pumpkin soup. Hi Dawn, it's great comfort food. And luckily we have some more int he freezer! :-) Thanks for the comment. Sweet potato and pumpkin...double the pleasure with this combination. Hi Karen, yup, double good double pleasure. :-) Thanks for the comment. I would need to replace the chicken stock with a vegetable stock, otherwise this soup is perfect. Hi Emma, chicken stock doesn't have all that much flavor, so vegetable stock -- or water -- would work well. Thanks for the comment. Yum!! 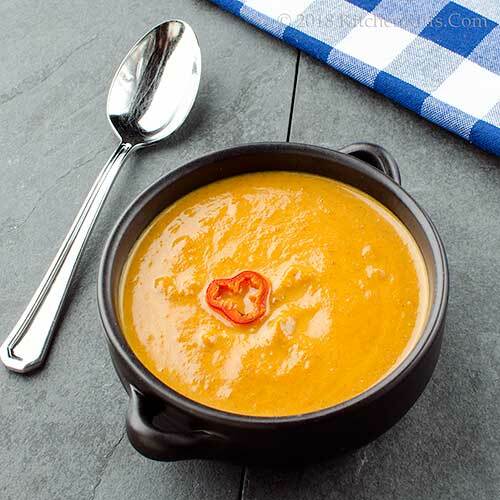 This spicy pumpkin soup recipe is right up my alley and I'm adding to my dinner menu soon! Nice recipe, John!! Hi Marcelle, this is SO good! You'll love it. :-) Thanks for the comment.